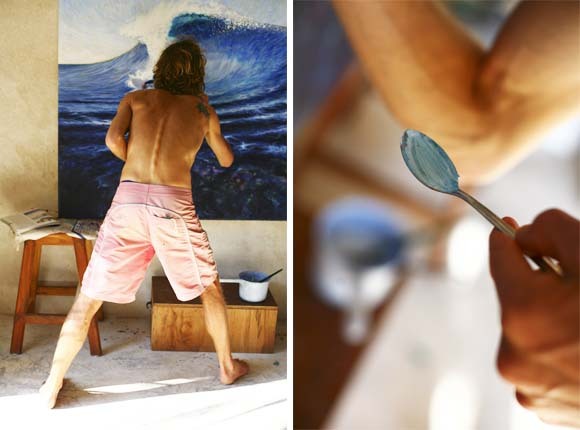 Aquaman has shed the rubber, put on his faded boardies, picked up a paintbrush and invaded my studio. The painting is a commission from another expat as a gift for a mate's 50th birthday. The recipient is a goofy footer with a solid bottom turn, hence the subject matter. Tom's choses medium is acrylic, and he likes to use up our teaspoons as his pallet with built in handle. Commissions welcome - please speak directly to his manager and publicist. She's the blogger. Amazing. I want one...but in it there has to be a giant shark fighting a giant squid...and a pirate ship.